Age UK and Age International bring to life what people’s donations could mean to an older person overseas. 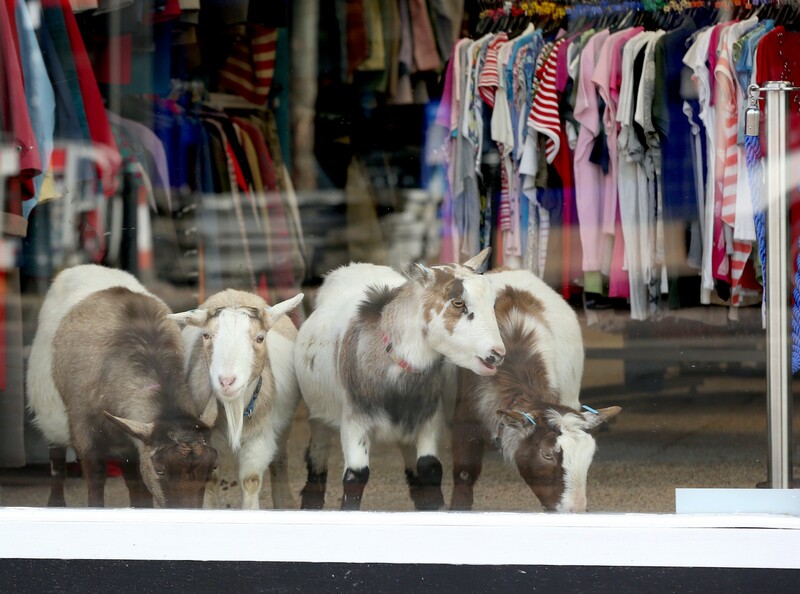 Goats, like these ones pictured in an Age UK shop, cost £18 each and provide milk, fertilizer and income. With figures showing that 63.6% of people aged 55 and over in the UK have grandchildren, Age International, partner charity of Age UK, is calling on the nation’s 11.32 million grandparents, and their families to donate unloved goods to Age UK shops. The goods will be sold on to help raise money for grandparents in desperate need. In the developing world it is estimated that there are more than 556 million grandparents, many of whom are the primary carers for their grandchildren. Age International works in 40 developing countries across the globe where in many cases older people survive on less than 60p per day. Often that money has to support not only themselves but also their grandchildren. Goats cost £18 each and provide milk, fertilizer and income for an older person overseas. Until 29 March 2013, Age UK will be working with Age International to collect bags of donated goods from doorsteps across the country to help raise money for Age International’s work with older people in developing countries. Money raised from donations will improve the lives of older people overseas in a variety of ways, from enabling them to set up sustainable businesses to ensuring that there is enough food and water for them and their grandchildren. Less than £10 could buy a chicken, school uniform, school books or mosquito nets for older people and their grandchildren. 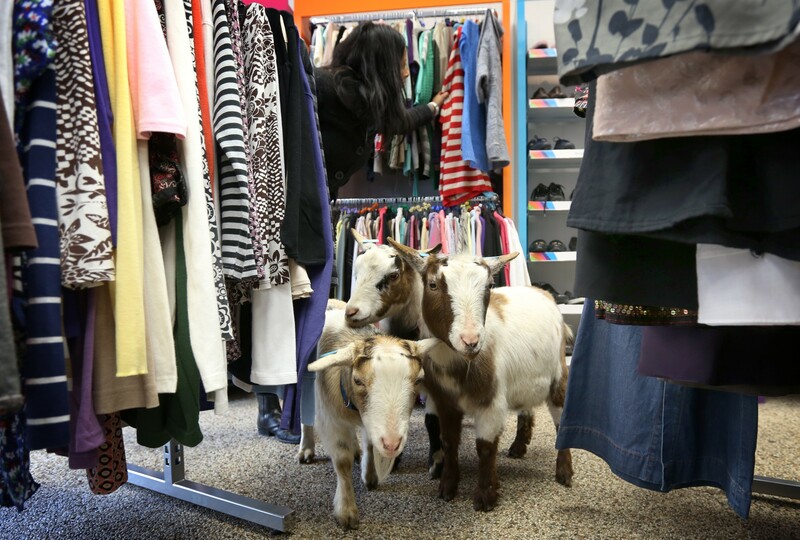 Goats, like the ones pictured above in an Age UK shop, cost just £18 and can provide milk, fertilizer and a valuable source of income. The pictures were taken in the Romford shop as part of Age UK and Age International’s work to highlight the value that donated goods can make to older people overseas. Donations can make a real difference to older people in the developing world a dress which sells for £5 could buy a chicken which provides eggs for nutrition and an invaluable source of income. While a man’s shirt which sells for £4 could buy a mosquito net for an older person, protecting them from malaria and potentially making the difference between life and death. People can donate by looking out for an Age International charity bag posted through their door before 29 March or by taking stock to their local Age UK shop. All items of quality clothes, shoes, accessories, home ware, toys and gifts will be greatly appreciated. Chris Roles, Director of Age International, said: ‘Older people in developing countries are some of the most ignored and marginalised people on the planet. That’s why we are urging local grandparents and their families to spare a thought for those in desperate need by donating clothes and other items to Age UK shops in March. Items that are collected and then sold through Age UK shops during this period will help to raise vital funds’. Jane Fearnley-Whittingstall, author of the Good Granny Guide and ambassador for Age International, said: ‘If you’re anything like me, you’ve got clothes you seldom or never wear, taking up valuable space in your wardrobe. Why not start spring-cleaning early by clearing the clutter now. By donating them to Age International you could help to improve the life of an older person overseas, as well as their grandchildren. So have a dig around for clothing, shoes and other donations that could change someone’s life’. Age International is the only UK charity focusing on older people in developing countries; it exists because older people in these countries are often ignored and have their needs neglected. For more detail on the methodology please contact Marcus Green at Age UK Research on 020 3033 1406 or marcus.green@ageuk.org.uk. Who’s caring for the kids?